Dr. Chainarong Na Lamphun (left) and Dr. Eden Y. Woon. INDEX International will offer three scholarships to Master’s students to pursue their education at the Asian Institute of Technology (AIT). 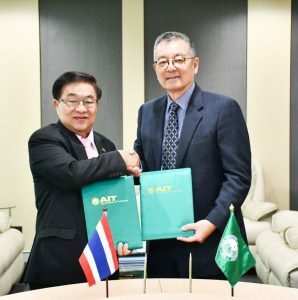 A formal Memorandum of Agreement (MoA) was signed by Dr. Chainarong Na Lamphun, President and CEO of Index International Group Co., and Dr. Eden Y. Woon, President of AIT on 19 March 2019. The scholarships follow the format of the INDEX International scholarships previously offered by Dr. Chainarong in 2017. The scholarships are available to Thai nationals, and they carry a bond requiring recipients to serve with INDEX International for a period of 48 months after the completion of their studies. One scholarship each goes to the School of Engineering and Technology (SET), the School of Environment, Resources, and Development (SERD), and the School of Management (SOM). Dr. Chainarong expressed his delight that two students had already benefited from the scholarship, adding that he is always happy to return to AIT. An alumnus of Water Resources Engineering (Master’s, 1980), Dr. Chainarong stated that AIT provided him with “opportunities, knowledge, and a network.” His three children also studied at AIT. While his eldest son, Dr. Phannachet Na Lamphun, completed his Ph.D. in Information and Communication Technologies in 2012, his daughter Dr. Pornlapas Na Lamphun gained her Ph.D. from the School of Management in 2012, and his youngest son Mr. Rathawit Na Lamphun (MBA, 2015) is currently pursuing his Ph.D. Mr. Rathawit also joined the MoA signing ceremony. He also offered support for the sixtieth-anniversary celebrations of AIT, adding that his company is celebrating its thirty-sixth anniversary later this year. President Woon thanked Dr. Chainarong, stating that one of his goals is to increase industry’s involvement with AIT. He mentioned that AIT will be establishing an entrepreneurship center that will offer co-working spaces, promote incubation, facilitate industry internships, provide mentorship, and encourage venture capitalists. Also representing AIT were Prof. Rajendra Shrestha, Dean, School of Environment, Resources, and Development, Prof. Nazrul Islam, Dean, School of Management, and Mr. Sanjeev Jayasinghe, Director, Office of Advancement and Alumni Affairs. Two INDEX International recipients from 2018 and 2019, Mr. Threeramate Apinuntaneesatit of Environmental Engineering and Management (SERD), and Ms. Dapaka Khumpai of Structural Engineering (SET) also attended the event.